Kraft Peanut Butter with Honey, spread on a piece of toast. 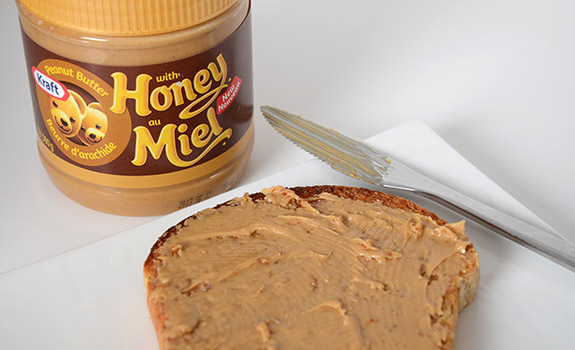 The first groundbreaking development for those who love pairing peanut butter and honey on their toast and sandwiches came with the invention and subsequent ubiquity of squeeze bottles, which made it so much easier to add honey and spread it on top of peanut butter without fear of contaminating the honey jar. How did our forefathers live without this? So, yes, it’s finally come to this. The flavour scientists have done the impossible, combining peanut butter and honey in a single jar. I would imagine it’s a complex process involving breakthroughs in wax elimination, and not just some intern having figured out that you can dump a jar of one into a vat of the other. It’s part of a new range of curious peanut butters (cranberry peanut butter?) from Kraft, much to the frustration of children everywhere who are back in their peanut-free schools. The Pitch: On the jar, all you need to say is “Kraft Peanut Butter with Honey.” I couldn’t find much more info on their website, www.kraftpeanutbutter.ca. The Look: Just like regular Kraft peanut butter, but in a smaller jar with a different label. The Taste: On its own (eaten from a spoon, like my five-year-old self would have enjoyed), it’s OK. There’s certainly more sweetness than in the regular smooth Kraft peanut butter, and the texture is grittier and firmer. On toast, it’s also fine on its own – until you sample it next to a slice with regular Kraft peanut butter plus some honey spread on top. In the pre-made PBwH, the honey is a background note. With the user-made combination, the honey stands out that much more. It’s sweeter, it’s more richly flavourful, and it’s just a better overall experience. Yeah, it’s stickier and more prone to dripping sweet honey all over the morning newspaper, but that’s a small price to pay. Cost: $4.99 for a 500 gram jar on sale at my Calgary Co-op. Value for cash money: Meh. Regular Kraft peanut butter is far cheaper (a 2 kg tub at my Co-op sells for less than $9), so the novelty/convenience comes with a cost. Nutrition? : Per 1 tbsp (15 grams): 80 calories, 6 grams of fat, 60 mg of sodium, 1 gram of fibre, 3 grams of protein. The verdict: If convenience really matters more than taste, go for it. A jar of regular Kraft peanut butter is more versatile – PB and honey, PB and jam/jelly, PB and pickle (don’t knock it until you’ve tried it) – so if you eat peanut butter with anything else other than honey, this seems like an extra jar in the cupboard for no good reason. True honey lovers also have a favourite type/brand of honey in the pantry, so that won’t work for them, either. I think other flavours in this new line might be more appealing, but the honey flavour feels like a brand extension that never needed to happen, even though it is the most obvious. I kinda like this pb. I’ve had the one with granola but don’t like it as much. I try the natural organic nut butters and like them, but there’s something about the kraft pb with the added salt and sugar that I rather like–and it’s so much gooey when on hot toast. Reading through your analysis at the end of your review, and noted PB and pickle…I used to eat those as a kid all the time….might be time to have one again….for old time’s sake… Love that someone else out there has tried it too! I love PB and pickle! It’s a surprisingly good combination. I still occasionally have one if the mood strikes me, though I worry about bringing one to the office lest I have to answer difficult questions about my taste in sammiches.